Light lemon chiffon in color, this wine is slate/clean with apricot, lychee fruit and floral aromas on the nose. Honeysuckle and apricot continue on the palate with subtle honey overtones for a lovely, voluptuous mouth feel, while a distinct minerality comes through when chilled. Medium dry, this is lean for a Viognier and I love that! Pretty, even feminine, enjoy simply as an aperitif while sitting in your summer garden or with light fare. Seriously affordable @ $14.99/bottle. Happy Summer! 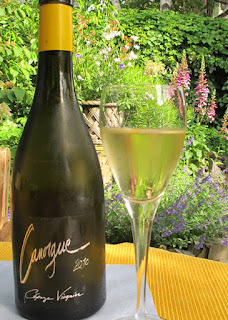 Viognier is best known as the white grape varietal from the northern Rhone Valley in the appellation of Condrieu which typically produces lush, complex, rare wines. This Viognier comes from the Southern Luberon region between Aix-en Provence and Avignon. While there’s plenty going on with this wine, it is easily quaffable! Fermented and aged in stainless steel “sur lies” (on the lies) makes for full aromas and flavors along with a dry clean finish. This is also organic and bio-dynamic, which means it was made without chemicals & pesticides using only natural and local soil amendments, and in concert with nature’s cycles (simply put). This wine comes to us from Chartrand Imports, who seek out beautiful wines that are also organic and/or biodynamic. 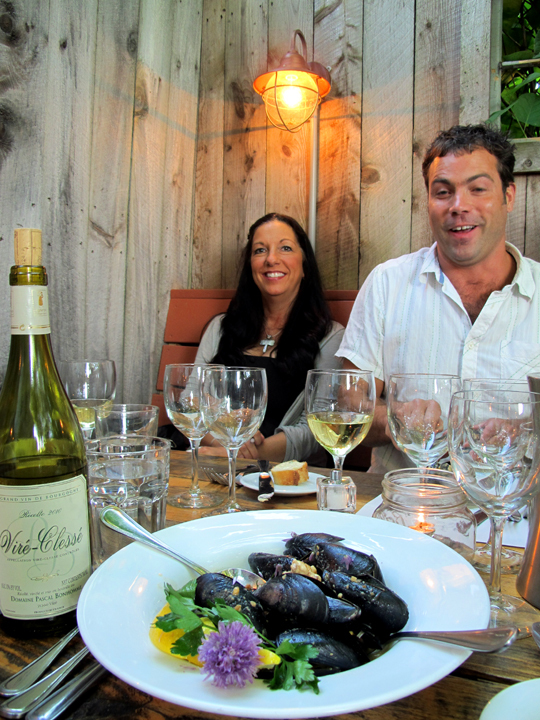 Rockland-based, Paul Chartrand sells more than 150 organic wines nationally and more than 60 in stores state-wide. He also helped establish Maine Organic Farmers and Gardeners Association in the 1970’s. His wines are distributed here in Maine by Pine State Beverage Co. The Canorgue Viognier may be found in Greater Portland area at Rosemont Markets, Royal River Natural Foods in Yarmouth and Tully’s in Wells. Midcoast it is available at the Damariscotta River Grill. Since it has been a couple of weeks since my last article, I hope to make it up to you with this one. Take your time ... Savor ... Enjoy! 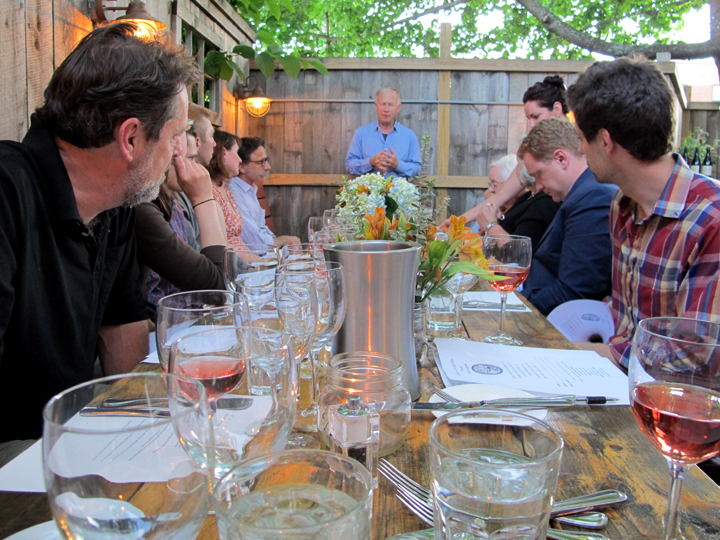 I recently welcomed the opportunity to attend the Weygandt Wine Dinner at Caiola’s, presented by Wicked Wines. “Since 1987, Peter Weygandt has been an importer of French wines and has gained a national and international reputation for the quality of his selections and his portfolio of top “boutique” French wines. In recent years he has expanded his portfolio to include US, Italian, German, Austrian, Australian, Slovenian and Spanish wines, more than 120 producers in all." He chooses wines he deems are both Natural and Great, as they are all farmed either sustainably or biodynamically. This means growing, nurturing, harvesting and actual winemaking are done with the utmost of care, returning to basics, returning to the source, producing in many cases, low yields of great quality, natural fermentation with no added yeasts and no filtration. He reportedly visits many of the vineyards as much as 2 or 3 times a year and has the winemakers' ears, so to speak, as they value his input. I for one, thoroughly enjoyed these wines and their unique expressions. Following is a bit of what went down! We were graced with 6 wines; the food pairings brilliantly chosen by Justin Wardwell (Wicked Wines) and prepared by Chef Abby Harmon. 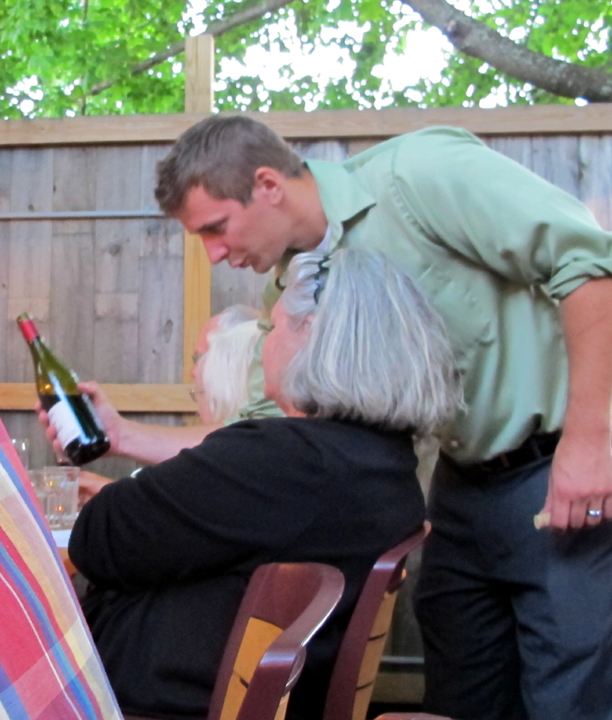 Nate Duncklee (Wicked Wines) was master pourer. 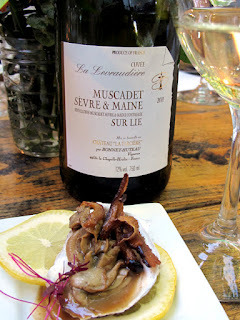 For first course, Bonnet-Hutteau Muscadet la Levraudiere 2011, from the appellation Muscadet-Sèvre-et-Maine in the western part of Loire region. Sèvre-et-Maine is located at the confluence of two small tributaries feeding into the Loire River on its way to the Atlantic. The grape is otherwise known as Melon ... or Melon de Bourgogne. Aged in subterranean cement tanks, it spent 6 months on lies (sur lie). Light lemon yellow in color, this was clean and briny with refreshing minerality on the nose. Lime zest along with calcerous schist comes through on the palate for a liveliness and wonderful clarity. It was paired with “Oysters Two Ways” - first with Pink Peppercorn Mignonette, then with Warm Mushroom Reduction. At the start crisp, clean and chilled, it worked beautifully with the bright flavored mignonette. I was curious about the second pairing ... warm mushroom and oyster on the half shell? 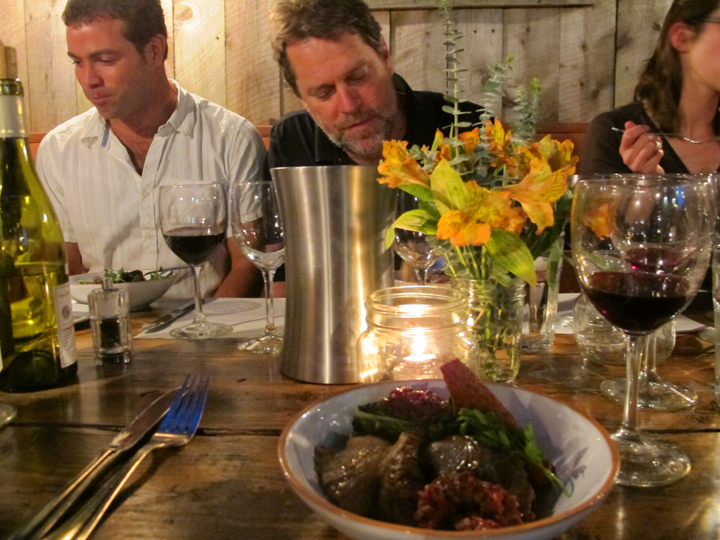 But it proved true, as the wine came down to temperature it married well with the warm earthy tones of the mushrooms. A magical progression! $12/bottle. 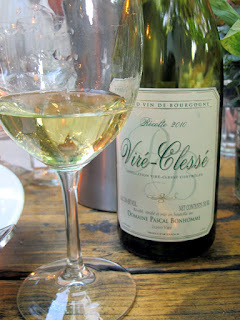 For 2nd course, Domaine Pascal Bonhomme Vire-Clesse’ 2010. This is 100% Chardonnay from the Maconnais in the Burgundy region. Elegance, gorgeousness and class personified. This beautiful wine was aged in stainless steel but exhibited a richness that made one think it touched some oak. Mais non! Light gold in color with chartreuse overtones, it was smooth and clean with a touch of floral on the nose. Lush and clean with bright acidity, body and depth without being overly heavy, it had a luxurious mouth feel, along with a lovely sense of romance! This was paired with Provencale Mussels w/Almond Puree and Chive Blossoms. Delightful and certainly one of my favorites of the evening! $21/bottle. "Winemaker Pascal Bonhomme has some of the best situated sites in Vire-Clesse and he makes every effort in his vines to convey that in the bottle." Sustainable farming is practiced and grapes are harvested completely by hand with meticulous vinification. This beautiful wine is just beginning to come to the US. 3rd course was the Chateau Mourgues du Gres - Les Galets Roses 2011 from Costiere de Nimes, located south of the Rhone region in Languedoc-Roussillon. Here is glacial soil expressed in its minerality. 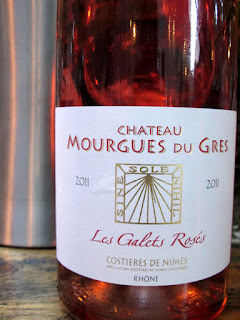 A blend of Grenache, Syrah and Mourvedre grapes, deep salmon pink in color, this wine is broad and gutsy, even racy. Clean and stony with wild berry & strawberry flavors and a long, dry finish. 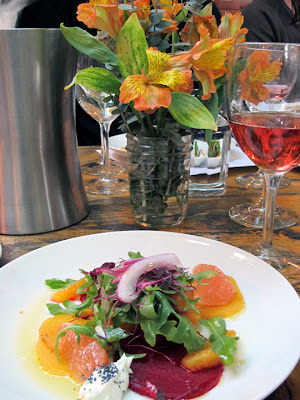 The visual pairing was instantly stunning – colors of Marinated Yellow and Red Beets with Herbed Goat Cheese, Pickled Red Onions and Arugula Peppercress Salad echoing the intense color of the wine. This followed through on the palate, with clean depth and enough weight to certainly stand up to the spiciness of the beets and greens. $16/bottle. Mourgues (a convent) du Gres is located on the last "spill" of the glacial galets (of Chateauneuf-du-Pape fame), at the end of the Rhone, near Beaucaire. 4th course, Domaine Vissoux Pierre-Marie Chermette Beaujolais 2011 from Lyon. Beaujolais the area is located in the southern part of the Burgundy region and south of the Maconnais. Grape is Gamay. 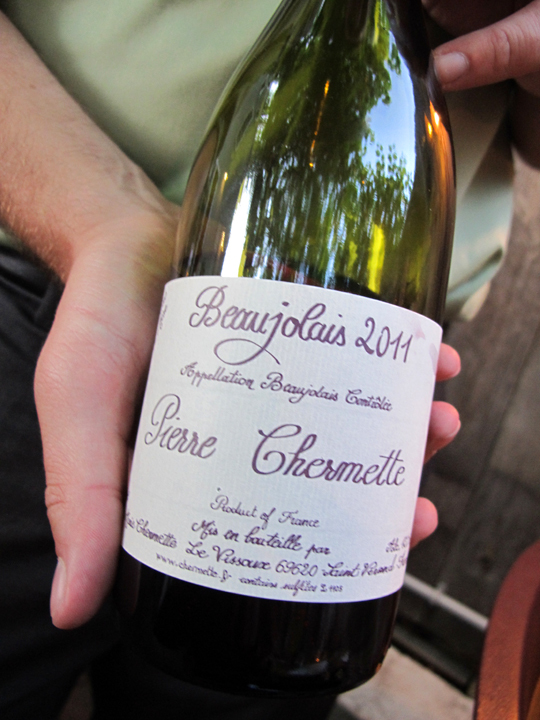 With handwritten style label, Peter (Weygandt) noted that this is the beaujolais at “Willi’s Wine Bar” in Paris and just about every Bar-A-Vin in Paris. (I think I know a French Bistro in town that would be a perfect fit ... right Jean-Claude?!) Harvested with low yield and no added yeast, this wine is fermented naturally with just wild yeast and bottled with little or no filtration. Soil is granite. This one started with bright fruit and simplicity, as one would expect. However, with some time it exhibited much more complexity, pepper and depth, with notes of bark, cranberry and currant.This was paired nicely with a simple course of Italian Cheese Sformata w/thyme, asparagus orange Vinaigrette. Deep fruits married well with the creaminess of the cheese. I would love to take this wine on a picnic!! $16/bottle. "Winemaker Pierre Chermette's yields are so low and the grapes so naturally ripe that he does not chaptalize. He uses only indigenous yeasts (no " banana yeast " culture, a la Duboeuf). Then a traditional, longer fermentation, aging in oak foudre and bottling for us with no filtration, and without adding any sulfites, in most vintages. It is as natural a Beaujolais as one could have had in a café in Lyon in the 40’s." 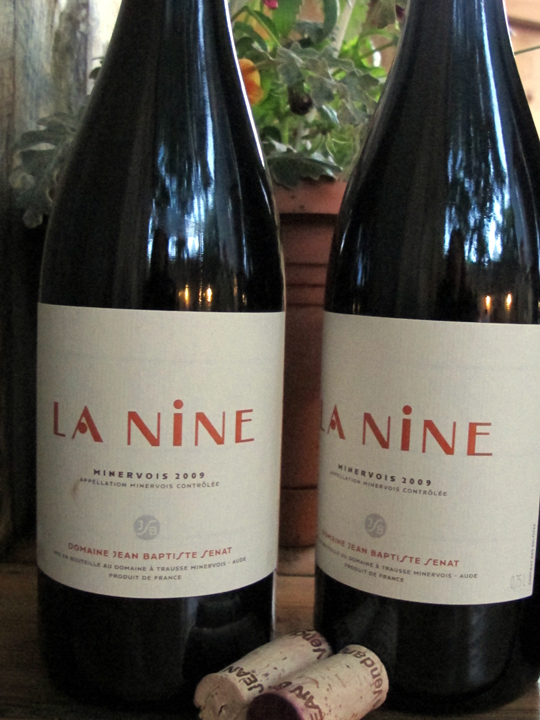 Main course featured Domaine Jean Baptiste Senat La Nine Minervois 2009, from the area of Minervois in the Languedoc region of southern France. A blend of Grenache, Mourvedre and Carignan, this was another one of my evening favorites. One is greeted by a deep rich color and a funky earthiness as well as freshness of pure fruit on the nose. Notes of plum along with deep dark cherry and subtle elegant dark earth fill the mouth. I sense the great length/depth coming from the Mourvedre. Gorgeous blend. Winemaking is biodyamic and comes from a producer formerly of Paris. The vines are treated with care, handpicked and harvested and let to ripen in clusters to preserve flavor and purity. Weeding and pruning are done the old fashioned way - by hand. “The genius of the grape” explains Winemaker Jean-Baptiste, “is that it is more intelligent than man. It’s only when you mix one variety with another that they reveal their true richness. The earth is alive and the vines are healthy, giving sincere wines that are neither pretentious nor overbearing”. This clearly comes through when tipping ones glass to taste. Paired with braised lamb shank w/polenta, sauteed kale and baba ghanouj, I could hardly pick up my pen to write! Sensual and soul filling ... $23/bottle. Justin Wardwell (W. Wines) & John Naylor (Rosemont Market) enjoying lamb & La Nine! And to top off the entire evening with light and sparkles ... Albert Mann Crémant d'Alsace Brut. Alsace is located on the German border of northeast France, east of Champagne and north of Burgundy. A celebratory blend of Pinot Blanc, Auxerrois, Pinot Gris and Riesling grapes this was absolutely delightful. A touch of sweet, but harmonious, well integrated and clean to the finish, it makes one want to dance! Again this wine is biodynamic winemaking with artful care in its creation. The last pairing (if you could bear one more lovely thing) was a dish of Fresh Fig with Strawberry, Gorgonzola and Crispy Prosciutto. This pairing could easily have been a summer luncheon in itself! $23/bottle. These wines may be found in the Portland area at: Rosemont Markets (Brighton, Munjoy Hill & Yarmouth) and Old Port Wines. Restaurants include: Caiola's, Street & Co. and Vignola's. Midcoast you can find them at: Rare in Rockland and Primo's. Downeast: Sawyer's Specialty, Southwest Harbor; House Wine, Bar Harbor; Le Domaine, Hancock; The French Cellars, Machias. In Bangor area: Bangor Wine & Cheese, State St. Wine Cellar and Fiddlehead's restaurant. I knew I wanted to write about this wine the moment I tasted it. This is effervescent bliss on the nose ... no, really! Pale yellow in color, this sparkler has refreshing scents of citrus lime, light floral notes of honeysuckle and mayflower, along with a touch of fruity green apple. It’s as if a trace wave of sea air fills the nostrils. 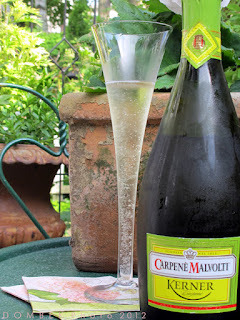 Vivacious, lively bubbles dance in the glass. Lush and clean all at once, this wine exhibits minerality with rounder creamy/yeasty notes when it comes down a bit in temperature, but is ultimately lean and dry to a lovely, lingering finish. Enjoying as an aperitif on one's garden patio or a seaside porch would be an ideal pairing; perhaps while nibbling on smoked salmon and cucumber on crostini, oysters on the half shell, caprese salad of fresh mozzarella, tomato and basil or even lightly battered fried calamari. I could drink this like there is no tomorrow! Of course, this is even better shared by two or more! Many may not be familiar with the grape Kerner? This is an aromatic white hybrid created by crossing the red varietal Trollinger (also known as Schiava) and the white varietal Riesling. It is most heavily planted in Germany’s Rheinhessen and Pfalz regions, but is also grown in Austria, Switzerland and the Italian province of South Tyrol. 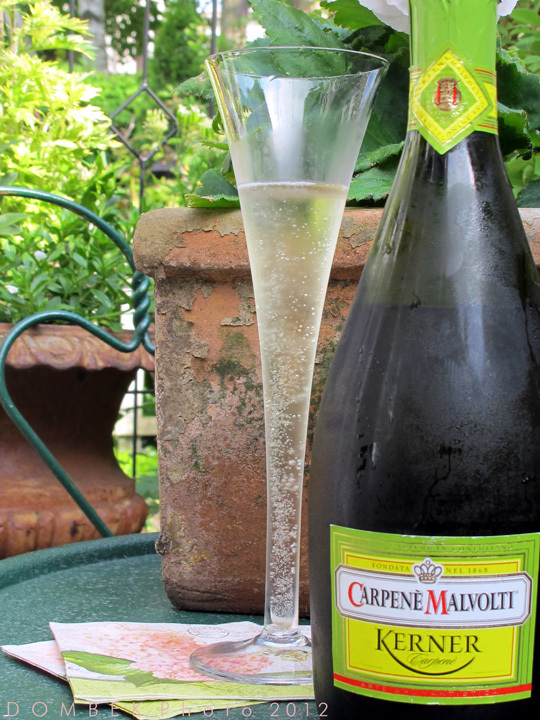 Here we find it in the nearby Veneto region of Italy, from winemaker Antonio Spinazzè and the winemaking house of Carpenè Malvolti, one of the oldest and most prestigious houses noted for helping to establish a great Italian winemaking tradition. It was founded in 1868 by Antonio Carpenè, who reportedly established the first Oenology school in Italy dedicated to the study of grape growing and winemaking. Imported by Angelini Wine, Ltd, Centerbrook, CT and brought to us here in Maine by Pine State Beverage Co. Find it at Old Port Wine Merchants on Commercial St. in Portland for $22.99.